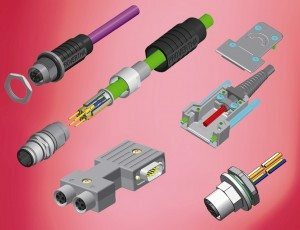 The extensive I-Net connector series and its solutions for a fail-safe and functionally secure data transfer via PROFIBUS, CAN bus, PROFINET and Industrial Ethernet will be the exhibition highlight of Provertha Connectors, Cables & Solutions GmbH in Hall 11, Booth D26 at the HMI Hanover Industrial Fair, April 23 to 27, 2012, in Hanover, Germany. The comprehensive portfolio offers Provertha’s customers an easy and time-saving assembly. New to the PROFINET and Industrial Ethernet program are D coded female and male M12 panel mount connectors, optionally deliverable with pre-assembled Provertha Wireclips and ready for wave soldering. This completes the program for the cable part comprising male M12 crimp cable connectors, crimp panel feed-thrus and patch cords M12–M12 and M12–RJ45. Also new to the PROFIBUS portfolio are the Opto Plug&Play M12 fiber optic bus repeater connectors with optical bypass option for long distance transmission via glass fiber as well as very compact M12 male fiber optic cable connectors. M12 complete this part of the program. The products are available for three types of glass fiber, POF, HCS, and GI. B coded female and male panel mount connectors, also deliverable with pre-assembled Wireclips for wave soldering, extend the program for transmission via copper cable. Together with Plug&Play M12 bus connectors, M12 crimp male cable connectors and M12 patch cords as well as M12 T and Y pieces, Y splitters and panel feed-thrus for field assembly, the new products provide a complete and compatible program for signal transmission via copper cable or glass fiber. Provertha’s CAN bus offering is further extended by A coded male and female M12 panel mount connectors, optionally available with pre-assembled Wireclips, too. As an example for Provertha’s extensive D-Sub hood portfolio serves the new innovative QuickMount D-Sub full-metal hood generation, designed for simple and secure field assembly. All screws are pre-mounted unlosable, so assembly delays caused by lost screws are a matter of the past. Assembly time is greatly reduced especially under difficult light and mounting conditions. This entry was posted in Connectors, Europe. Bookmark the permalink.